"The greater danger for most of us lies not in setting our aim to high and falling short; but in setting our aim too low, and achieving our mark". This past week has been a monumental one...a confluence of different fortuitous elements that have joined together and elevated me to new levels of joy. I will be taking journeys this year and next...at least three, but perhaps more. The first is to Salt Spring Island, British Columbia next month..I have made all necessary plans to have a small place to stay, transportation and lots of reading material. Recently I finally purchased a respectable camera to bring into my sphere of creative tools...it has been long overdue but finally it has arrived. This British Columbia trip will be the first opportunity to try out my new creative companion, to absorb the beauty that is everywhere in BC and hopefully come back with a hopper full of ideas waiting to be released onto the canvas. I will also be heading to the States briefly this summer for another project....a very important one. I will leave it at that but suffice it to say it will be an incredible experience that will leave me a changed individual, of that I am certain. As I have mentioned the Newfoundland trip rounds out the hat trick of journeys this year...from one coast to the next! It will be interesting to see how my impressions of the two different sides of the country manifest themselves in paintings. The challenge will be to include the figure in these pieces...which will be especially tricky considering I will be approaching strangers in all likelihood. However, it is do or die, and I will rise to the challenge and face my fears. I cannot wait to share the photos and feelings from these travels. I suppose these developments have made me realize how really, with enough effort, anything can be achieved. Belief in yourself is of paramount importance...also, accepting the fact that you might not achieve what you want-the letter night not be answered, the race might not be won, the painting might be relegated to the darkest corner of your basement after being deemed a failure. However, failures make successes all the more sweet...they provide the basis for which the joy of achievement can rest upon. Do not dwell upon missed marks, failed tests, abandoned projects. They are there to serve as tools to help us grow and learn from our mistakes. They are just as important as the goals we do achieve, the strongest paintings, the fastest race times, the sweetest victories. The events that lie ahead fill me with a desire to push myself even further, further inward and outward in search of personal fulfillment and creative purpose. On a more directly work-related note I was talking with my friend Jim today and we were discussing still life paintings and rendering. I am working on a still life right now which I will post upon it's completion. 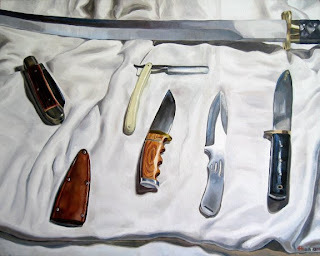 Jim and I discussed my previous painting of my collection of knives and how detailed it is. I have altered my style a bit since those college days when the knives were painted...my reasoning is as follows: lots of artist can paint in an uber-detailed way...I want to paint differently, I want to distinguish my work with a slightly more impressionistic style, yet still with a degree of detail. I do admire artists who can paint things in an almost hyper real way...but I choose to adopt a different approach...again, my theory of economy of paint and strokes comes into play here...why execute 1,000 strokes to achieve your goal when you can use 100 to render your subject with similar feeling and emotion? 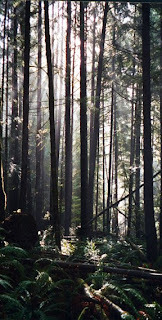 I have attached above a picture of the forest near China Beach on Vancouver Island and my "Knives" painting from third year college. Song I am listening to currently: "Like A Friend" by Pulp. Movie recently watched: Iron Man. Excellent all around blockbuster. I gave a damn about the characters which so many blockbusters lack the foresight to establish early on in the going. Yummy effects both visual and sound.